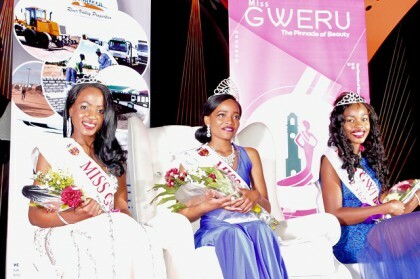 IT was all glitz and glamour on Friday night as 20-year-old Michelle Tugwete, a photographer by profession, was crowned Miss Gweru. Gweru residents braved the chilly weather and thronged the Cathedral Hall to witness the ceremony.Takudzwa Phiri (17), a hairdresser, was crowned the first princess and Kgotso Mhandu, a lower six student, walked away with the second princess title.Tugwete also walked away with the Miss Bikini title, and Takudzwa Phiri, who was the crowd favourite, won the Miss Personality title. Phiri, who has hearing and speech impairments, proved that disability is not inability as she managed to captivate the crowd’s attention with her charismatic persona. She was given a standing ovation by the crowd during the question and answer segment when she confidently answered the questions using sign language. Tugwete won a fully serviced residential stand courtesy of River valley properties, 32 inch flat screen TV and a one year educational sponsorship voucher. Phiri and Mhandu also won education vouchers for a full year and an Africom Dongle. As expected, Mukoko queen Ammara Brown did not disappoint as she had the crowd eating out of her hand. She first performed Bhachura, a hit she did with ExQ before performing Watchu Want with the crowd singing along. Due to overwhelming support Ammara received, she jumped off the stage and mixed with the cheerful crowd amid ululations from them. Ammara also performed the hit Mukoko sending the crowd into wild cheers. She also did not disappoint with the mesmerising dance moves accompanying her performance.